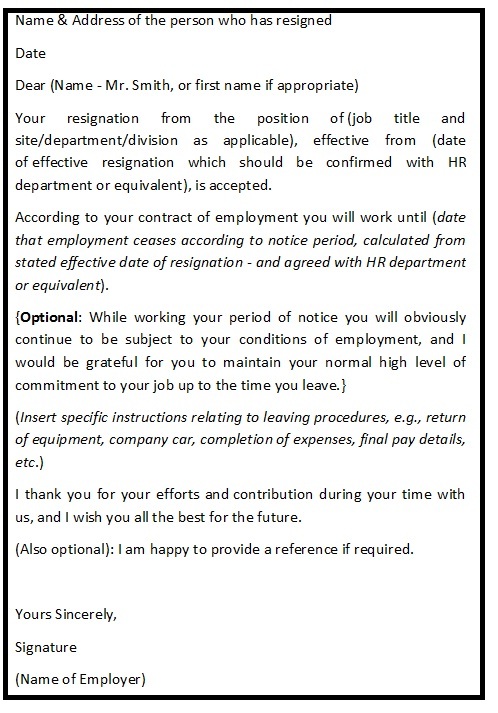 A resignation acceptance letter is the letter to an employee from an employer who have received and accordingly accepted the letter of resignation previously sent by the employee. A graceful resignation letter with professionally sound reasons to leave attracts a positive response of acceptance and signifies a healthy relationship between the two. 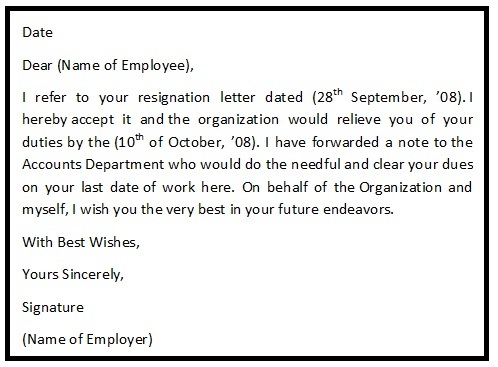 A resignation acceptance letter with a positive note acts as a matter of professional goodwill and mark of an employee’s dedication during his working years. In an acceptance letter, the employer generally recognizes the efforts and achievements of the employee and wishes him success and luck in his future endeavors. In addition to that, the employer asks the employee to complete the notice period to the best of his ability and transition of his responsibilities to the certain others.